In the 1960s, five hundred files were found relating to the 1930s slum clearance in Bedminster. These files were going to be thrown out by the City Council, but they have proved to be a very important archive, as they were surveys of the properties that were cleared in Bedminster. Details included how many people lived there, together with detailed descriptions and photographs. Later there was an excavation of the area. The area south of the river at ASDA is the area that the talk focused on. From the beginning it was poor land. It can be seen on an 1887 drawing of Bristol. It shows a lot of industry including, tanning, brewing, and a slaughterhouse in amongst the houses. The Bedminster soup kitchen started out as a school. By 1850 the houses were well-developed and the Zion Chapel was built. This is shown on the 1840 Tithe Map. The River Malago flows through the area and the Cut stopped this and it became an open sewer. On the Causeway, there were houses above a row of shops. The Industrial Revolution caused an influx of workers and people built more houses in their back yards; they were three storeys high. 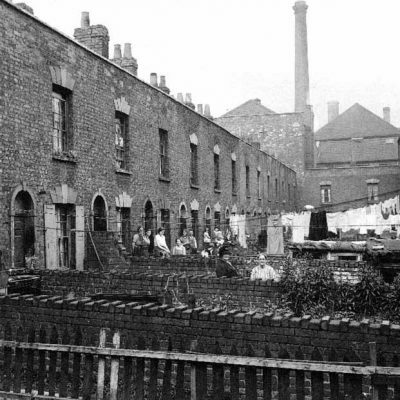 The area became over-crowded and became a squalid area. To get access to some of the houses one had to go through an archway; the walls of the alleyway was lit by gas lamp and the walls were lime washed. They were very narrow streets and some houses had 11 people in them. All these houses are gone now. In 1820 to use the privy you had to go out the front and round the corner and into a narrow lane; it was a communal privy. Some of the houses shared an abattoir roof and windows opened on to it. In 1833 many people were on Relief, which included widows or those bed-ridden. There was a Ragged School (intended for the most destitute children) in William Street and a Mission School. Dr. Doudney had a soup kitchen. Today, the Ragged School is the site of flats. Tanneries, glue-making, chemical works and a Malthouse could be found in the area around Hope Square. 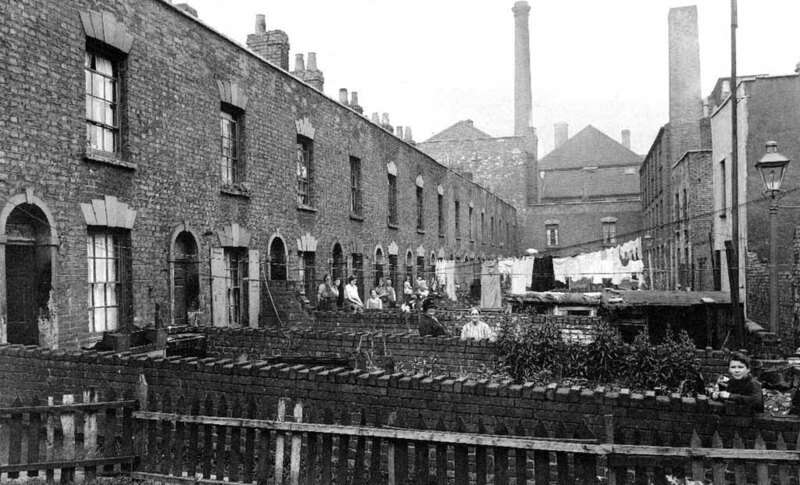 Squires Court was cleared of slums in 1933. The houses were not back-to-back at Weare’s Buildings, but they had front gardens. At the back were outhouses and this joined them with a privy and a copper for laundry. 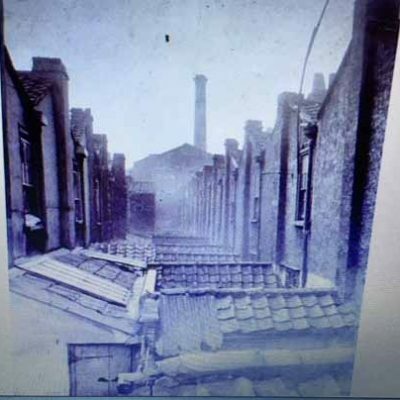 This close living caused many illnesses and there are lists of these illness that the occupants had who lived in Hope Square – pneumonia, rheumatism, chest infections, mental illness. Children had whooping cough, measles, scarlet fever and TB. in 1931 22 people contracted TB who lived in Hope Square. Many houses had no gas or electricity and they cooked on a range; they had no water supply. At the end of the 1700s, there was a brick kiln in the area and this was the reason the houses were raised up at Boot Lane. There were back-to-backs in Little George Street, St. Jude’s where 6 people lived. Detailed surveys were taken of all the houses, room by room. These surveys tell us that in 1919 Palmer’s Cottage had 6 children and a closing order on it. This was off Stillhouse Lane. Nothing remains to be seen today of this area of slum housing in Bedminster. 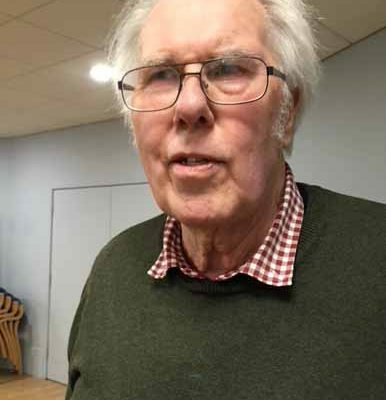 This was an interesting and shocking talk that told us that as late at the 1930s people were still living in appalling conditions in Bristol.